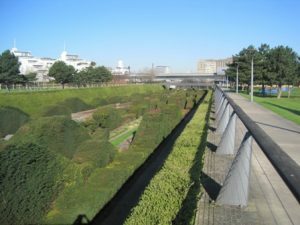 The Thames Barrier Park has an area of 14 hectares and is located north of the River Thames, east of Canary Wharf and south of the Royal Victoria Dock. There are great views of the Thames Flood Barrier (built to protect London from major flooding) and the River Thames from the park. The park was opened in 2000 and was the first new park to be built in London for 50 years. It has a riverside promenade, a plaza with 32 fountains which are popular with children especially in hot weather, meadows with 120 different types of wildflower, trees, hedges, a children’s play area, a cafe and toilets. A sunken garden with wavy hedges provides a sheltered microclimate and reflects the profile of an old lock entrance to the docks with the hedges representing waves.